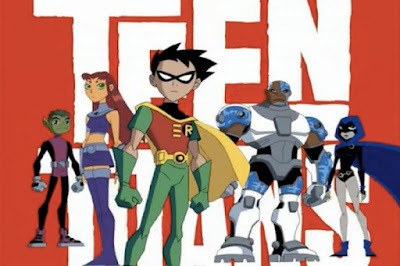 In my last post I reviewed the animated 2003 TV series “Teen Titans”, and basically described it as not only my favorite Superhero show, but my personal favorite animated TV series I ever had the privilege of growing up with. After all these years it’s still one of my favorite shows, animated or not. However, in my last post I only covered the principle characters, as well as every season’s main story arc. Now it’s time to look at some individual episodes from the show that I couldn’t cover last time. I’m going to keep it simple and rank my personal top 10 favorite episodes of the “Teen Titans” TV series. I won’t be including any episodes from the seasons main story arcs as I’ve already covered them, this will just be a countdown of my favorite stand alone episodes. 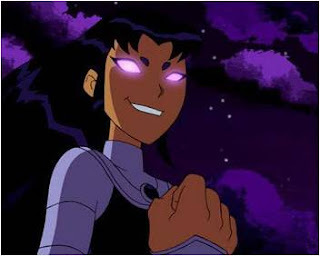 In this early season 1 episode, we’re introduced to Star Fires evil sister Black Fire, who aims to replace Star as a member of the Teen Titans. She’s also framed Star Fire for various crimes on other planets, which get the attention of some ruthless alien robots. Aside from an action packed plot, and a thrilling showdown between Star Fire and her wicked sister, this is actually a very sweet episode revolving around Star just trying to fit-in on earth. This is when we were getting introduced to all our hero’s, and it was a clear sign that the alien princess was going to have trouble fitting in. The result is some well placed comedy, and even some genuinely emotional moments. 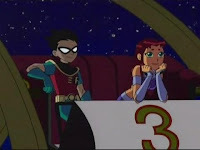 This episode was also important for establishing Robins loving relationship with Star Fire, which will be another highlight throughout the shows run. Just before season fives final arc took shape, we fans were treated to a special origin episode showing how this small team of heroes first came together. As Star Fire flees a race of sinister aliens, she stumbles onto earth, and begins making a scene. 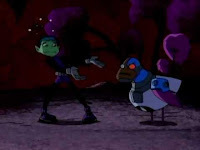 She first gets the attention of Robin, followed shortly by Beast Boy and Cyborg who are both ready to fight. At last Raven shows up to be the mediator. Through a series of events, the five heroes slowly become close friends and join forces to battle the invading aliens. Its great stuff, and a real treat to see how so many things first took shape. 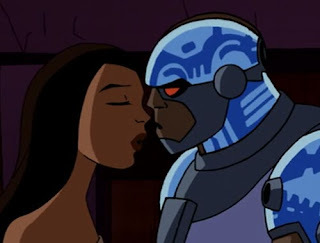 We see Cyborg drop his signature catch phrase for the first time, we see how Robin’s relation with Star Fire first took shape, and we see that Titans tower was built from a downed alien space craft. While I wish this could have been a two part event, it’s still very satisfying to see how these young heroes first came together, and the action is all pretty good. The premiere episode of season two gets things started on a very high, and even emotional note. At the Titans tower, it’s one of those days where the friends just can’t get along, and a tense argument breaks out. 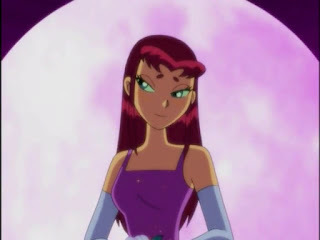 Star Fire, being the emotional center of the group, fears that this may be the end of their friendship as she knows it. 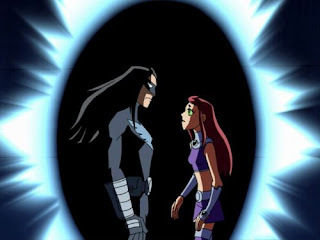 Soon, during a fight with a time traveling villain, Star Fire finds herself sent to a dark and brooding future where her former friends are no longer together. Thus, she tries desperately to seek out her teammates, go back in time and prevent this awful future from ever happening. 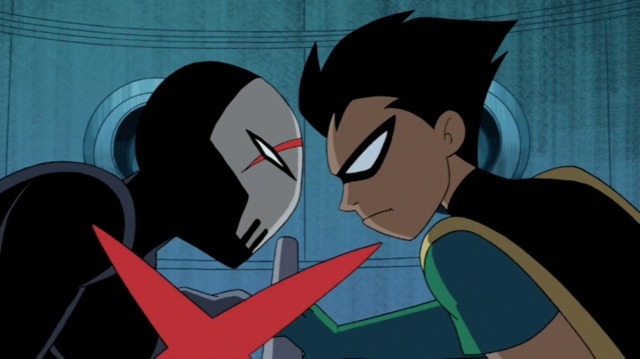 This episode subsequently features Robin take the form of Nightwing, the premise is great, and the finally is one of the most touching the show has to offer. 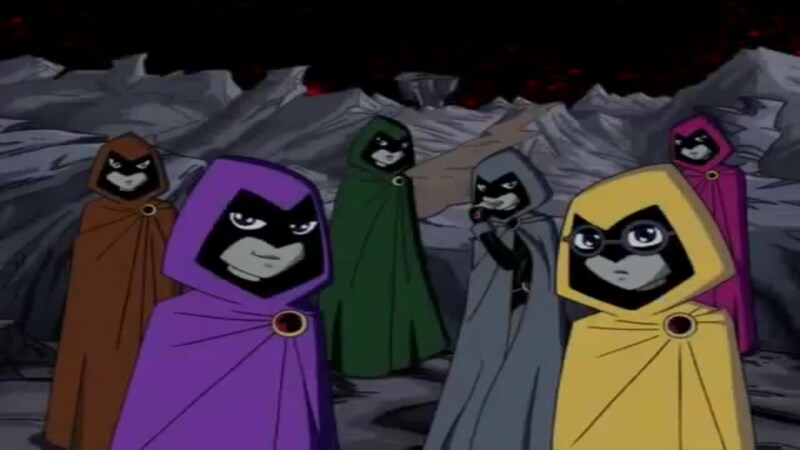 This is the first Raven centered episode, it hints at her dark side, highlights her friendship with the other team members, and has quiet the creative premise to boot. Upon discovering an enchanted mirror in Ravens room, Beast Boy and Cyborg are transported to a dark dimension of sorts. Turns out, this dark realm is actually Ravens mind, and we meet various parts of Ravens personality along the way. Just before our hero’s can escape, there engaged in a tense battle with Ravens demonic father Trigon. Aside from being a great character centered episode, with a unique setting, and great action, this is also a very funny episode. Ravens various personalities lead to some very funny moments, her interactions with the team are great, and even the setting of Ravens mind has a funny personality in of itself. 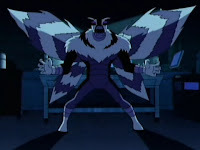 When a new villain called Killer Moth threatens the city with an army of mutated killer insects, he demands that the city declare him the new ruler, and on a side note, he forces Robin to take his nasty doubter Kitten on a date to the prom. This episode is a perfect blend of exciting action and comedy. 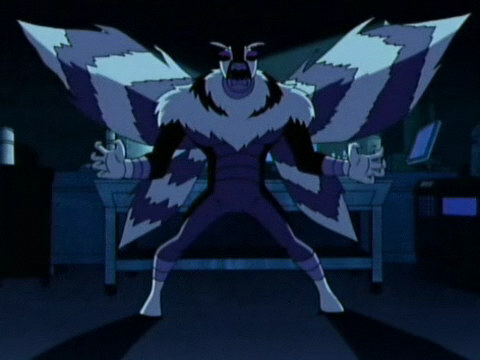 We have the Titans battling a variety of different insect monsters, while also watching Robin in this funny position of taking the villains doubter for a night out. It’s all good, but it makes my list of personal favorite episodes for one reason alone ... it is firkin hilarious to see Star Fire get jealous. Holly Cow, watching Star Fire loose her cool over this nasty girl taking advantage of Robin is a sheer joy to behold, which leads into an equally amusing cat fight between the two. There’s also several nice little details in this episode. I like that we finally see our hero’s out of costume for once, I like the variety of different insect monsters on display, and it’s a nice little progression of Robin and Star Fires relation. 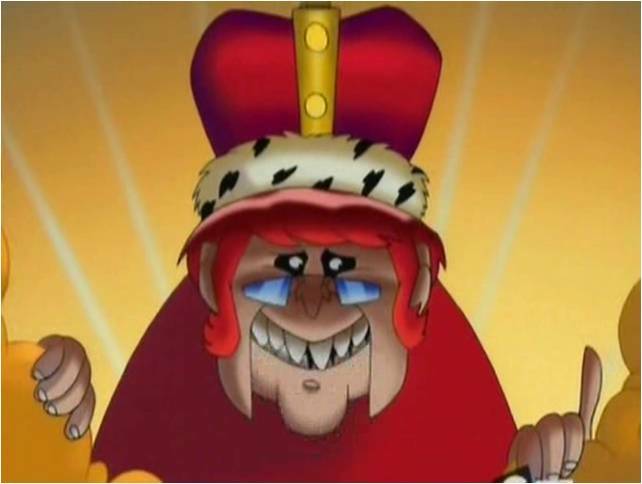 Throughout the shows run, we had a lot of really silly, goofball villains, and I think the funniest by far is Mad Mod, voiced by the great Malcolm McDowell. 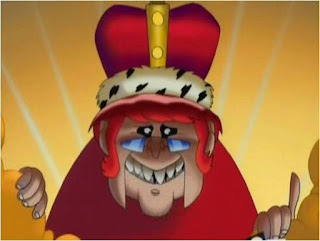 He’s a comedic British villain bent on reshaping America in his own image. 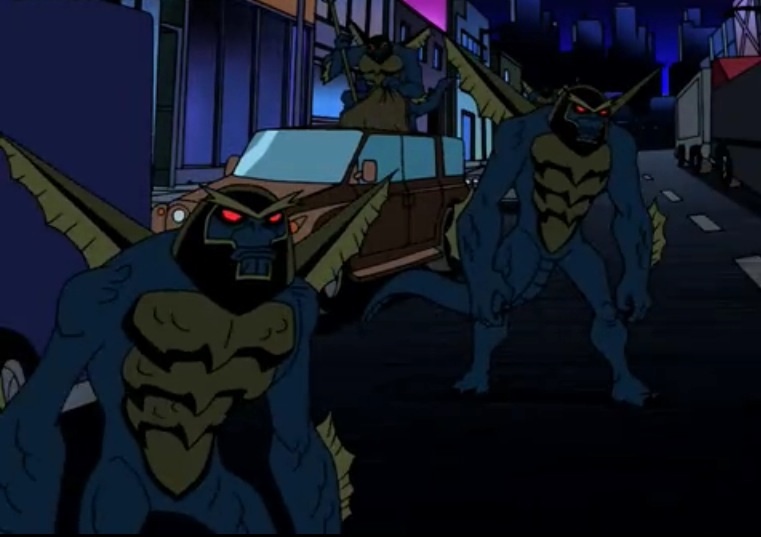 In the season 3 episode “Revolution”, he launches an attack during the Independence Day celebration, takes Robin captive, and steals his youth for good measure. Now our four remaining Titans struggle on a way to take down their adversary without the aid of their team leader. It’s a different conflict for our heroes to be in, and there’s a great message on how to make compromise when faced against improbable odds. Aside from all that, I think this might just be the funniest episode of the whole show. Sense we have a British villain taking center stage, there’s lots of references to famous British comedy, most especially Monty Python. It’s become a tradition for me to watch this episode every 4th of July, it packs some of the best laughs, has great character moments, and of course it further highlights one of the shows funniest villains. While investigating a broken down space station, our heroes are suddenly attacked by a savage alien monster. In the ensuing battle, their vehicle gets damaged, our hero’s get separated, and find themselves stranded on a hostile alien planet. The premise lends itself to some great outer space action, but first and for most, this is another one of my favorite “funny” episodes. 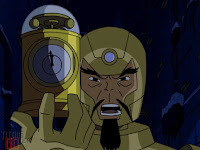 This episode features some of the greatest Beast Boy and Cyborg moments as the two try to repair their downed ship. 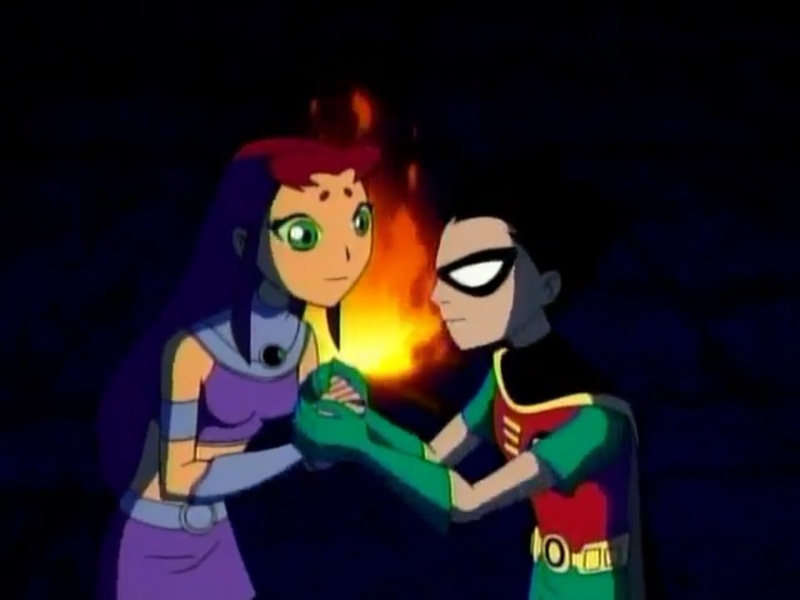 Of course this episode marks a significant turning point in Robin and Star Fires relationship. It’s cute and all, but their relationship is also laced with some brilliant comedic moments. 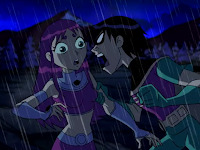 The two go back and forth on whether or not Star Fire is in fact his “girl friend”, and the two openly discuss how they feel for each other. It all builds to a satisfying finally in which the two team up to defeat there alien attacker. This episode seems to have a little bit of everything, it’s funny, romantic, action packed and highlights the show when it’s at its best. Even though Robins story arc concluded way back in season 1, his journey of understanding what it means to be a hero still continues throughout. 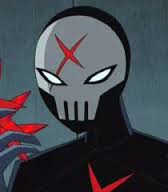 One of his standout episodes comes early in season 3, when he encounters a new villain barring the exact same Red X costume he wore in an effort to draw out Slade. So now it’s like Robin is facing and confronting his own personal demons in an external form. Robins inner monologue heard throughout the episode give great incite as to why he’s such a compelling lead hero. Red X himself made for a great new addition to the series, and was the most mysterious of the Titans rouges gallery. He was a walking enigma, we didn’t know who he was under the mask, we didn’t know if he had any real connection to Robin or how he came to be, which only got us more excited to see him. 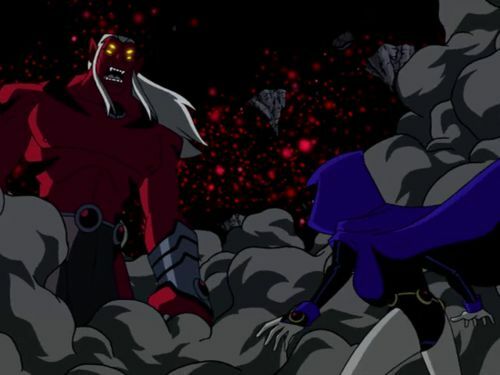 The highlight of the episode comes during the climax in which Robin and Red X team up to rescue the Titans from another villain. It’s like for one brief moment Robin finally made peace with his inner demons, and it helped set the stage for further encounters’ with this exciting new character. 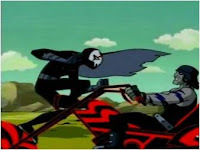 Long before I was thrilled by “Mad Max: Furry Road”, or discovered the comedic genius of “It’s a Mad, Mad, Mad, Mad World”, I had this awesome and hilarious little “Teen Titans” episode. 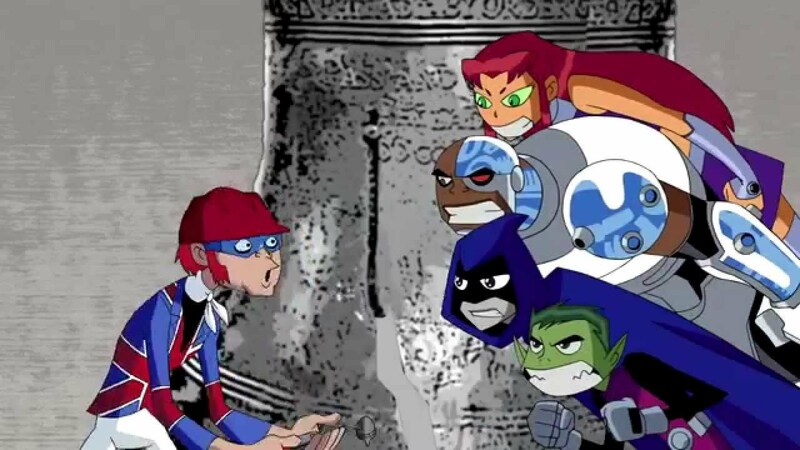 When Robins secret possessions are stolen by a new villain, a wager is made that they will be given away as a prize to anyone who can beat him in a race. 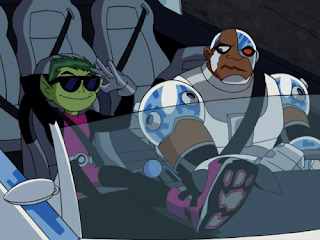 Thus the whole episode is one big epic car chase, with our heroes racing an army of the shows main reoccurring villains, who are all eager to claim Robins secret goods. Most notably, this draws out Red X, who engages Robin in a deeply thrilling motorcycle chase. Once again there’s some great comedy provided by Cyborg and Beast Boy, who throughout the chase are battling a silly gas station on wheels. This might just be the most entertaining episode of the whole series, it’s got the comedy, high-speed excitement, and a great premise to boot. 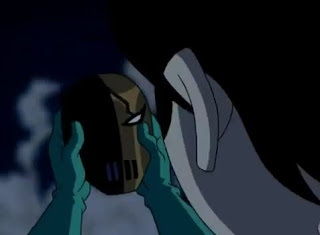 After the villain Slade perished at the end of Season 2, it seemed that the Titans greatest threat was finally gone for good, but Robin refuses to believe that he could be gone that easily. Soon, Slade starts making sudden appearances all over the place, and engages our hero in some brutal fights. To make matters worse, this is Robins fight alone, as none of the other Titans can see or hear Slade. This is probably the darkest episode of the whole series, with some really tense moments, Robins anger turning him into a threat to his friends, and Slade himself has never been more terrifying. We also have a great mystery slowly being unraveled, as to how this ghostly apparition of Robins greatest foe came to be. 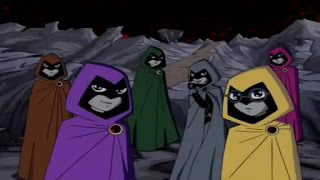 There’s a stand out moment when Raven enters his mind, and we get a terrific little montage of Robins history leading to this moment. 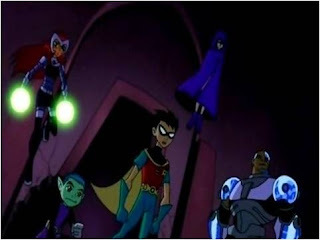 Even when Robins battle seems won, the episode ends on an ominous high note, indicating that Slade may return for real. This was the episode that proved how versatile the show can be. We’ve had some really lighthearted and funny episodes before, but this episode was dead serious. 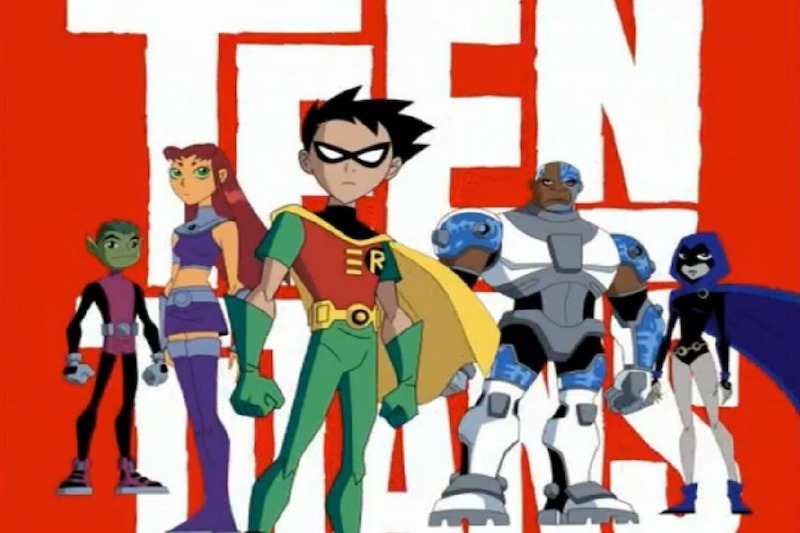 That covers my personal favorite episodes, in my next post I’ll be reviewing the animated movie “Teen Titans: Trouble in Tokyo”.